And if you would like to save a little money in the process of protecting the big panting pup, you should consider buying this Advocate 12 Pack, which will prevent you from having to empty your wallet for another six months. This powerful topical is only applied once a month, and is proven effective against these potentially life threatening parasites, so grab your supplies in bulk today. You can use almost any other product with different different active ingredients, we can recommend Advantix or Nexgard. 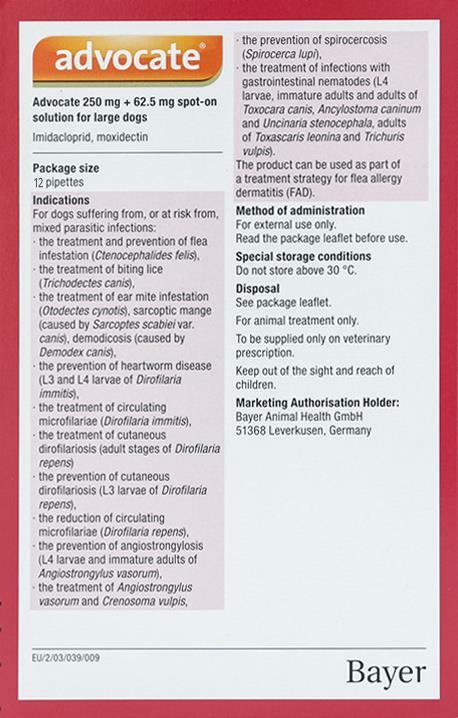 The Advocate product sold in the UK also prevents against lung worm. Does the product you sell in the USA also prevent against lung worm? It did not specify it in the list of items it prevents. Thank you. This is actually the UK product. It covers the most common lungworm within dogs which is Angiostrongylus. You can see this on the box clearly. IS ADVOCATE SAFE TO USE ON DOGS THAT HAVE TESTED POSITIVE FOR HEATWORMS? Advocate is a prevention of heartworms. It doesn't treat it. Please get advise what to use if your dog has heartworms. Can this product be divided to be used on different sized dogs....mine range from 5 lbs.to 75 lbs I have done Frontline Plus like this......but it is not as effective....as they have built up tolerance to it. We don't recommend dividing this products as it is very small amount of liquid, it is almost impossible to divide properly. You should use different products on your different size dogs. Hi David, Yes we have ship to Queensland Australia. Expiry date is roughly 2 years. Generally the items are manufactured about six months ago with a three year lifetime, so on average you have about 2.5 years before the expiry date is reached.